The benefit to natural light is that it requires no special equipment. Its already there, set up and waiting for you to use it. The drawback is that unless you have very good friends in very high places, or very specialized equipment and a lot of help, you have absolutely no control over it. Use natural light for perched birds. Use direct sunlight for flying birds. Make sure the sun is behind you in direct sunlight. You aren't going to freeze the wings effectively with a fast shutter speed and get a good image. You will either end up using a high ISO and get a noisy image or your image will be too dark and in any event your shutter speed just isn't fast enough, even if it is 1/8000 second. So, when using direct sunlight, lower your ISO, use a 1/500 to 1/1000shutter speed and be satisfied with the results or get a good flash unit that syncs with your camera at high shutter speeds. Look Ma, no wings! Shutter 1/500, late afternoon sun. Just chalk the shot up to bad luck and keep shooting. With this subject, no matter the lighting method, you will end up with plenty throw away shots. I admit that my failure to frequently use only natural light has to do with depth of field. If you can live with only the head in focus, you can use a larger aperture, let more light get to the sensor and get some perfectly acceptable images. But if you want the whole bird in focus consistently and want to freeze the wings, you are going to need flash in one configuration or another, because you will need to use smaller apertures. Hummingbird in the shade of a house in mid-afternoon. Notice that the gold highlights are still there. These off-color highlights will consistently be shown when using on-camera flash. The primary reason to use on-camera flash is to gain additional Depth of Field. If you can gain one or two stops by using flash, you can close the aperture to f/11 or f/16 and still properly expose a bird that is shaded from the sun. This will allow most, if not all, of the bird to be in focus. 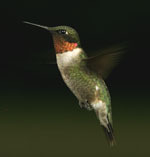 The classic multiple-flashes-around-the-feeder method of shooting birds falls into this category, though only one off-camera flash is necessary. The benefit is optimum, controlled lighting conditions that allow shooting at f/11 or f/16 and give good DOF. 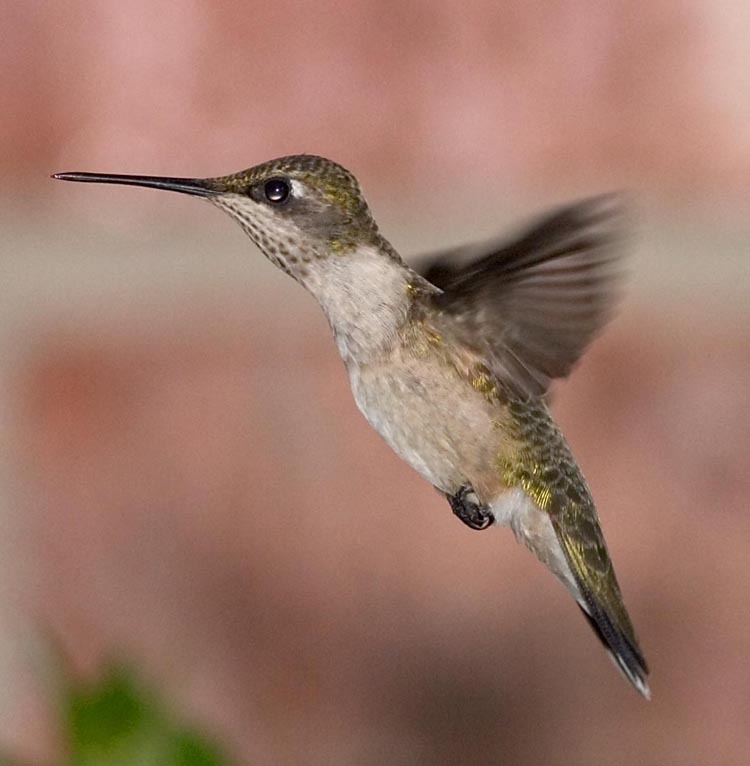 The drawback is that you can only shoot hummingbirds at one fairly small location. 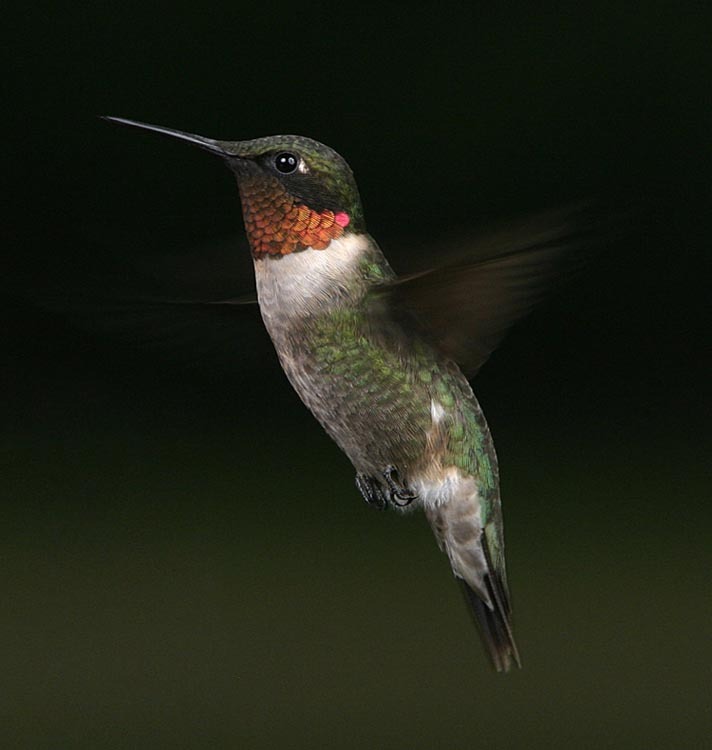 Some sites suggest placing your feeder among flowers for this method. Actually placing nectar in flowers works too. 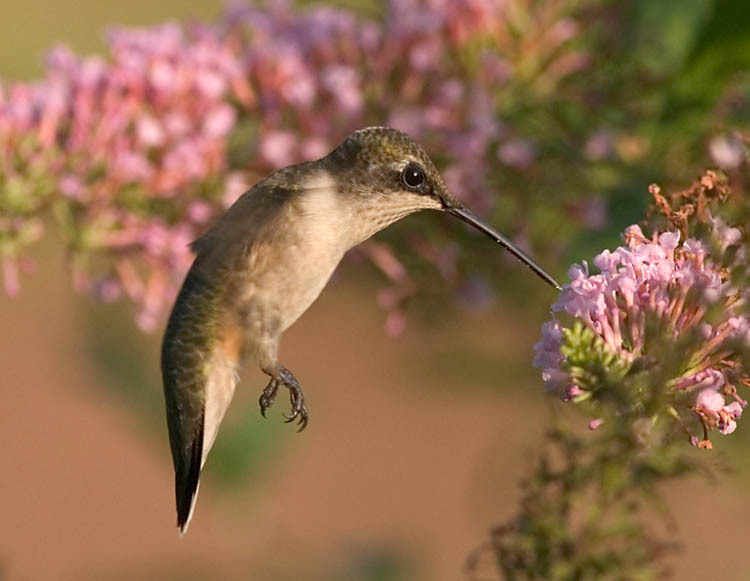 It is possible to get birds feeding at flowers with this method, though a feeder will likely be a more consistent hummingbird draw. In any event, this is the method that is going to produce the wow shots. Two hot-shoe flashes diffused with umbrellas. Two Hot-Shoe Flashes, no diffusers. Notice the more "shiny" look and gray areas. Notice that the wings are not frozen in the first image above. Though this is the method to use if you want to freeze wings, frozen wings are not a requirement. Notice also that the background is a simple gradient caused by an out of focus yard with dark trees in the distance. Creative placement of the feeder or simply putting a plant, a bush or some flowers and having one flash that illuminates the background can give a more pleasant effect. 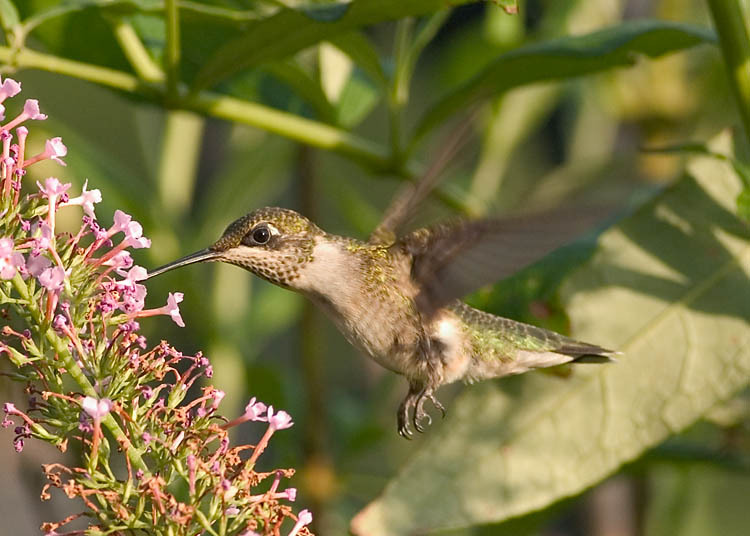 Of course, there are tricks to narrowing the hummingbird's feeding focus or getting him to stay longer at one flower that are discussed in my Tips and Tricks section. With this method, the use of diffusers is impractical since you need as much light output as possible. Notice the gold highlights in the above photo due to the small angle of the non-diffused, distant flashes. 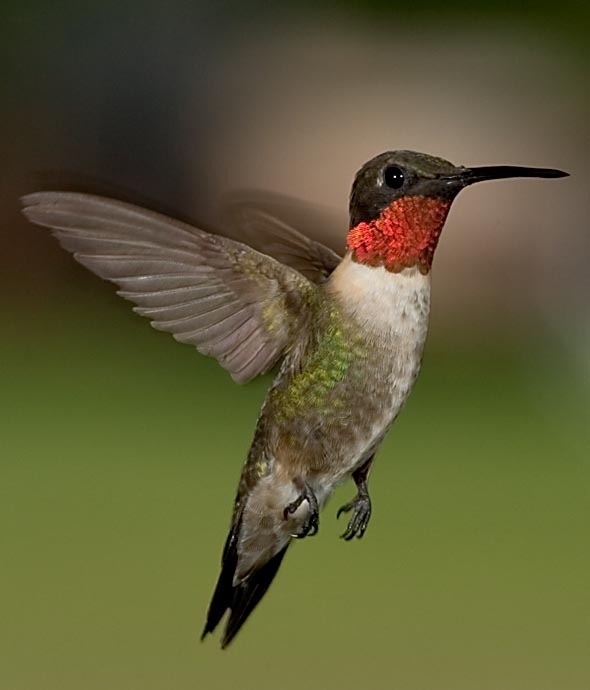 However, when trying to capture a hummingbird that is feeding, it is a good idea to keep in mind that the flower is also a very important part of the image and people will forgive less than perfect colors on the bird. Aside from combining flash with sunlight which has already been discussed, I have seen shots where on-camera flash is combined with off-camera flash. This provides a simple way of sync'ing the flash units with optical slaves triggered by the on camera flash. It also de-emphasizes the specular highlights created by the on-camera flash by illuminating the bird from other angles while not eliminating the specular highlights altogether.